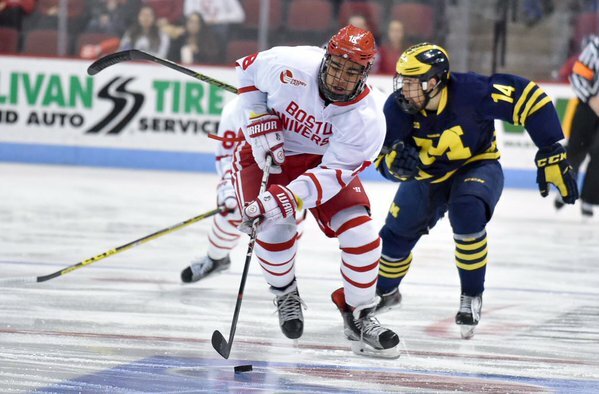 ESPN’s Corey Pronman has published his annual NHL top prospect rankings with five current Terriers and three former Terriers included: #1 Clayton Keller, #4 Charlie McAvoy, #57 Dante Fabbro, #67 Jordan Greenway (photo), #70 Patrick Harper, #81 Kieffer Bellows, HM David Farrance. Jake Oettinger was #6 among goalies. 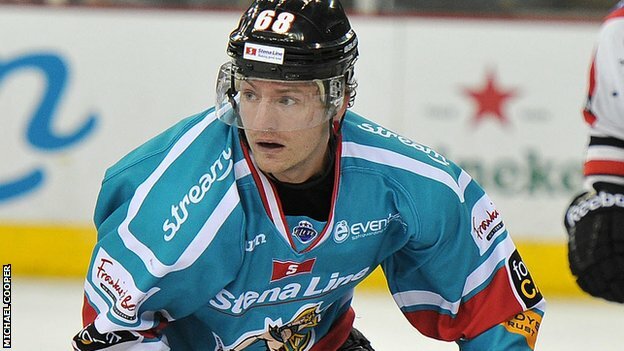 Chris Higgins, a dynamic Terrier forward, who scored 132 points over four seasons at BU, announced his retirement from the Belfast Giants of the UK Elite League. Higgins played three of the past four seasons with the Giants, earning the nickname, “The Belfast Datsyuk" and producing a career-best 55 points. At BU, he won two Hockey East titles (2006, 2009), a national championship (2009) and Hockey East’s Sportsmanship Award (2008). Higgins first Beanpot game produced one of that tournament’s iconic goals. Former Terrier captain Steve Thornton, a member of the 1995 national championship squad, is in his fourth year as Head of Hockey Operations for the Giants. Shane Johnson, a BU defenseman who also skated for the 1995 champions is Project Manager for the NCAA Friendship Four Tournament in Belfast that features Hockey East and ECAC teams. BU makes its first appearance in November 2018. Both Thornton and Johnson are former on-ice standouts for the Giants. Two more Terriers will be skating in Europe this season. Former BU assistant captain Cason Hohmann is heading across the pond to play for HC Banska Bystrica in Slovakia. The Texas native, who scored 92 points as a Terrier, spent most of the past two seasons in the ECHL, scoring 57 points in 2015-16. Ahti Oksanen has returned to Finland, signing with SaiPa of the Finnish Liiga after spending last season with ECHL Greenville (52 points in 53 games) and AHL Hartford. As a Terrier he scored 51 goals and 115 points. 2019 recruit Robert Mastrosimone and 2020 recruit Cade Webber are members of the US Under-17 Select Team headed to the Czech Republic for next week’s Five Nations Tournament with games against Switzerland, Slovakia, Germany and the hosts. Mastrosimone, after two high-scoring years at Shattuck St. Mary’s, will join the USHL Chicago Steel, while Webber, a 6’4” defenseman, skates for The Rivers School, coached by former BU All-American Shawn McEachern. Team Manager for the U.S. squad is former Terrier forward and assistant coach Ken Rausch. A trio of Terrier seniors were selected in last night’s NWHL entry draft. 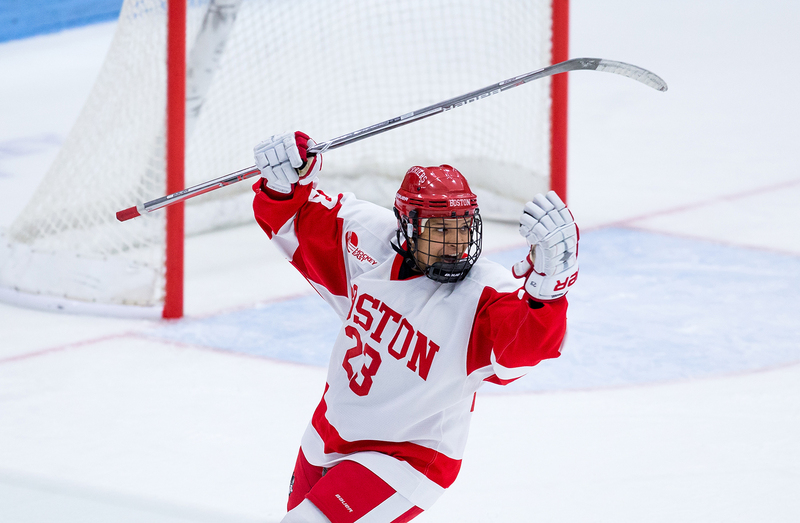 Victoria Bach, who led Hockey East in scoring last year (49 points) and captain Rebecca Leslie (34 points) were picked by the New York Riveters, while Nina Rodgers, who transferred to BU from Minnesota (31 points) was selected by the Connecticut Whale.